First to 50 points wins? That was what I wrote on Twitter at one point early in Tuesday’s game between Kansas State and Texas Tech. Well, that first team was Kansas State and the Wildcats took care of the Red Raiders, 58-45, on Tuesday night. I have to admit — this was not the game I expected. 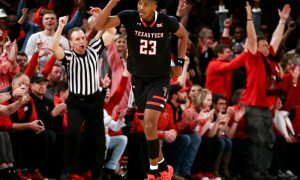 I felt the Red Raiders (15-4, 4-3 in Big 12) coming off a two-game skid last week, would come in highly motivated and play a better overall game than they had in either appearance on the floor last week. Not that Kansas State (15-4, 5-2) is a pushover at home, but the Red Raiders had beaten them in their first meeting. Plus, K-State was riding a four-game winning streak in Big 12 action and you know what happens to streaks in this league, right? They tend to die before they generate a tremendous amount of steam. 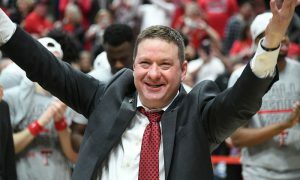 Instead, after the two teams spent 12 minutes trying to figure each other out, Kansas State asserted itself as the dominant team in this one, matching Tech’s famed defensive intensity while the Red Raiders struggled to shoot from the floor and struggled to turn the 17 turnovers the Wildcats had into points. We knew what these teams were coming into this game. And they played like it, too. But K-State played appreciably better. Facing a Red Raiders team that leads the nation in field-goal defense (35 percent), the Wildcats shot 47 percent from the floor (and were at 50 percent at halftime). K-State forced the Red Raiders into 13 turnovers, outrebounded them by 7 and nursed their 8-point halftime lead by not experiencing the dips from the field that Texas Tech did. More on that in a bit. Plus, there was Barry Brown Jr., who ended up with 15 points, 7 rebounds, 3 steals and 1 assist. I put Dean Wade on my Big 12 Starting Lineup for last week and for good reason. As I’ve outlined, Wade’s return has bumped K-State’s shooting, rebounding and defensive numbers in positive directions. 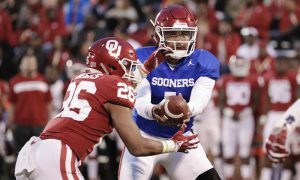 But it’s Brown who may end up being the team’s prime candidate to be the Big 12 Player of the Year. After all, Brown was averaging more than 20 points in his previous four Big 12 games. And his defense also has him on the watch list for the Naismith Defensive Player of the Year award. Wade had a nice game too, scoring 13 points and grabbing 4 rebounds. He didn’t dominate, but when the Wildcats are at full strength he doesn’t need to. 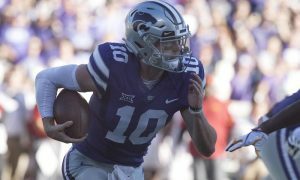 The Wildcats got significant production out of five of their core six players, but as I explained to our Pete Mundo when we recorded our part of the Heartland College Sports radio show for this week, I talked about how my one concern about K-State right now is that it needs more than just Brown, Wade, Kamau Stokes, Makol Mawien, Xavier Sneed and Cartier Diarra to step up offensively. So, almost right on cue, Mike McGuirl had 9 points. McGuirl is an interesting player. He brings energy to the floor, but he’s an inconsistent scorer. While he had 9 points on Tuesday, he had no points against Tech in the first matchup. 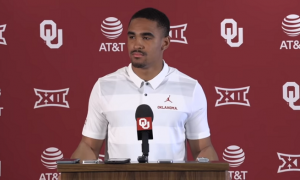 And, while he had 18 points against West Virginia in that massive comeback, he followed that with five combined points in the next three games. Perhaps it’s too much to ask, as there is only one basketball. But if I’m head coach Bruce Weber I’d rather see consistent production from McGuirl to make this a legitimate seven-player rotation by the end of league play. But for the 11th time this season the Wildcats held a team under 60 points. Plus, the victory was the team’s fifth straight, which is its longest win streak in Big 12 action since 2015. I pegged K-State No. 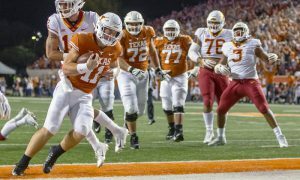 1 in my Big 12 Power Rankings on Monday. They backed it up with a great performance against Texas Tech. Tech’s problem in its first two losses in Big 12 action could be distilled down to one thing that could be corrected. 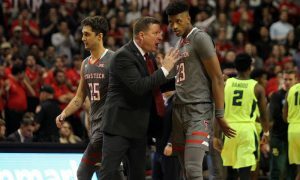 Against K-State the issue was a larger problem that needs to be addressed — the supporting cast around Jarrett Culver. The sophomore guard got his on Tuesday, scoring 17 points. It wasn’t as efficient a game as head coach Chris Beard would like, but that was par for the course Tuesday night. The only real additional help he received was from Tariq Owens, who came off the bench to score 12 points. He had a real impact early in this one with a 3-pointer, which is not his forte, and some other great action near the basket. But the rest of the Red Raiders combined for 16 points. That has to change. The big culprits were Davide Moretti (6 points) and Matt Mooney (2 points). In fact, at the under-8 timeout of the second half the pair combined for 3 points. The pair were a combined 3-for-15 from the floor. Perhaps the Wildcats watched that film from their first meeting, a Red Raiders win and took notes. In that game on Jan. 5, a 63-57 K-State loss, Moretti had 19 points and Mooney had 14 points. In fact, it was Culver who had the off night with just 9 points. It’s like the script flipped. 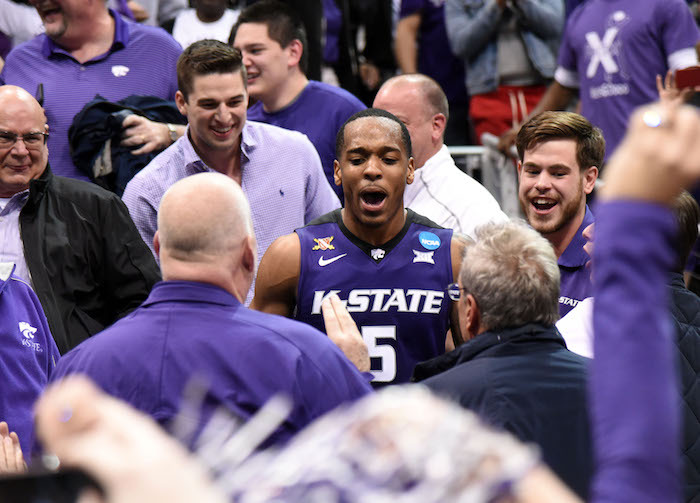 K-State knew coming in that Culver would get his points and they were content with that. 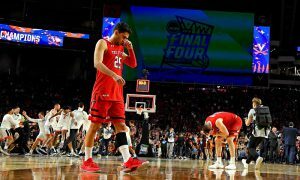 But by not allowing Moretti and Mooney to hurt them, the Wildcats severely limited the Red Raiders’ offensive options, especially late in the game when they simply had to toss 3-pointers at the basket in an attempt to get back in the game. At the end, the Red Raiders shot 32.7 percent for the game and 21.7 percent from the 3-point line. There were points in this game where the Red Raiders went 10 minutes without a field goal (in the first half as K-State built a 10-point lead) and went five minutes without a point (as K-State protected their lead in the second half). No team in the Big 12 can survive stretches like that. So is it time to panic in Lubbock? Maybe a little bit. Both teams had significant motivation in this game. The winner is tied with Kansas at the top of the league. The loser falls a game behind. Had Tech won it would have swept the season series and accumulated a terrific tiebreaker on K-State. Instead, they split the season series. That’s a critical split when you consider what is coming down the line. Both the Red Raiders and Wildcats have two meetings each with Kansas next month. The win means the Wildcats are better positioned — at least at the moment — to challenge Kansas for the league crown. The Red Raiders didn’t roll over in this one. The Wildcats went out and won it. Period. And both still control their destiny in the Big 12 race. I mean, we’re not even halfway through the season. And this was, by far, one of the best plays of the night, courtesy of Sneed. We have two more Big 12 games set for Wednesday night, with Texas headed to TCU for a 6 p.m. game on ESPNU, followed by basketball’s version of Bedlam as Oklahoma State hosts Oklahoma at 8 p.m., also on ESPNU. And, don’t forget. I’ll Facebook Live again around 8 p.m. Thursday to talk about trends in Big 12 action and set up the weekend for the Big 12-SEC Challenge.